iSpring has again been acknowledged as a Top 20 Authoring Tools Company by Training Industry. The first list was released in 2011, and this year, iSpring has been named in the rankings for the third time in a row! Training Industry is an expert online resource for learning professionals. It provides information about best practices and innovative approaches, and creates an environment for trust and information sharing among learning pros. This year, Training Industry has recognized iSpring, the vendor of iSpring Suite, the robust authoring toolkit which helps content creators build quality eLearning content: courses, videolectures, quizzes, screencasts, software tutorials, drag-and-drop activities, conversation simulations, and more. eLearning professionals around the globe love iSpring Suite for its ease of use, the likes of which is hard to find anywhere else in the industry. 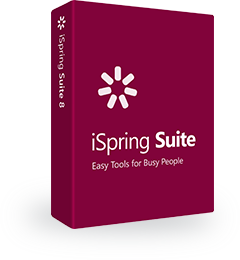 The iSpring toolkit allows them to create courses and assessments fast, without spending hours or even days on learning how to use all the options. Plus, if your organization already has training materials in PPT and PDF, you can, in a matter of minutes, turn them into online courses which work with any modern LMS. This way, even for a just-launched program, you can create a ready supply of courses and training materials. We have also received yet another acknowledgement recently – getting a Double Gold in the Brandon Hall Excellence Awards has kicked off 2019 with a bang. This winter, iSpring Suite has also been named a leader in the ”Best Course Authoring Software” category by G2 Crowd. G2 Crowd ranks authoring tools according to two basic criteria: user satisfaction and market presence. The former metric is a combination of more than 15 scores retrieved from user reviews at G2 Crowd and third-party websites. Those tools which rank high on both criteria earn a spot in the Leader category. G2 Crowd is a crowd service which leverages thousands of reviews to help businesses make confident software choices for their upcoming projects. G2 Crowd aggregates peer reviews from verified employees of real organizations, providing customers with relevant, real-time, and unbiased data. iSpring is the best engineered, most reliable eLearning development tool that I use. As a Training Consultant, I use many different eLearning tools, depending on the project and my client’s wishes. With some tools that I use, I worry about the published lesson because the things that I build do not always work in the finished product. But iSpring REALLY WORKS. I’ve thrown many challenges to iSpring over the years (Windows 8, Office 13, various devices, etc) but the always seem to be the same: it works. On the desktop. On my iPad. On a Samsung Galaxy or iPhone. It WORKS. We have purchased the iSpring Suite as well as iSpring Flip. These software’s are exceptionally intuitive to the user and everything is very well-integrated. The icing on the cake however is the amazing Customer Service. Our workforce includes many frontline training staff who wear multiple hats: many are classroom trainers as well as part-time designers of face-to-face as well as online learning experiences. While we use a variety of tools, iSpring is easy and affordable for them and helps them do more than just shovel bullet points onto slides and upload them as “eLearning”. The interactions, quiz types, and new characters offer easy opportunities for building in interest and some interactivity.